Eating Healthy in the College Years Colleen Poling, Erica Buchanan, and Nicole Sagaria. 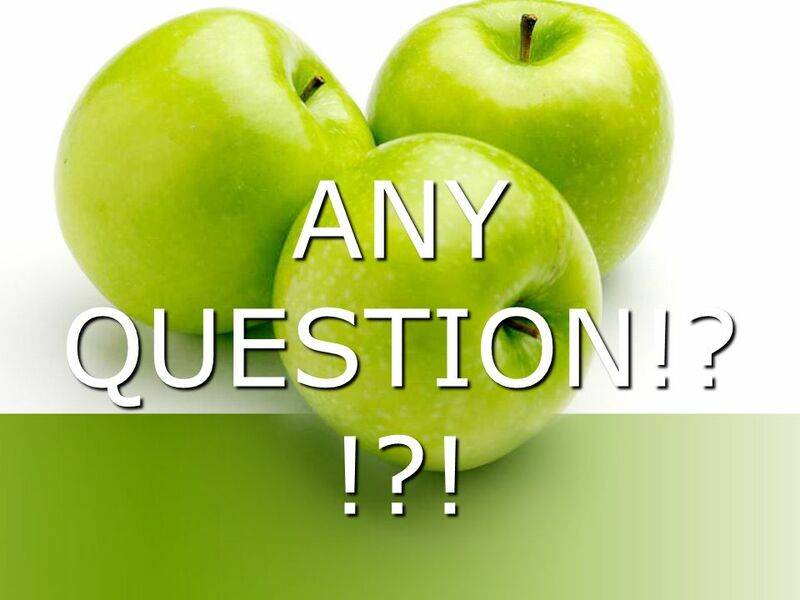 2 The questions you may ask…. Why? 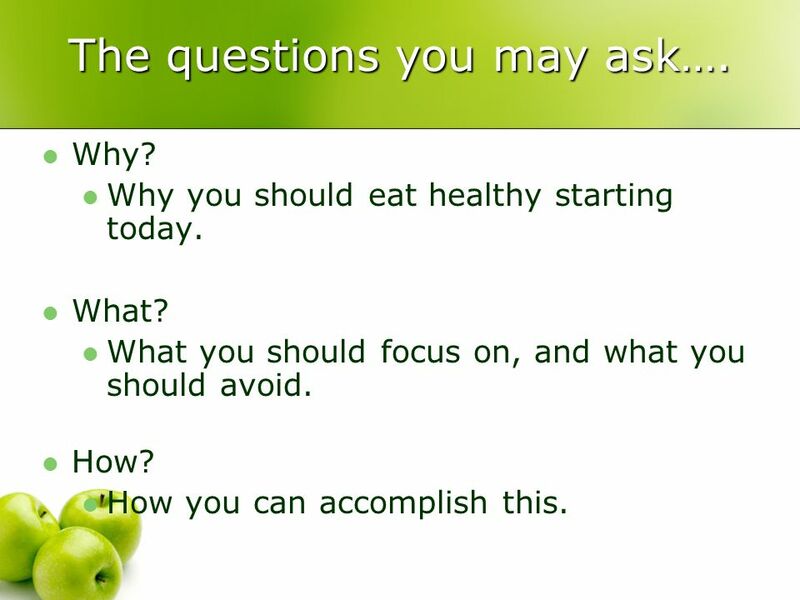 Why you should eat healthy starting today. What? What you should focus on, and what you should avoid. How? How you can accomplish this. 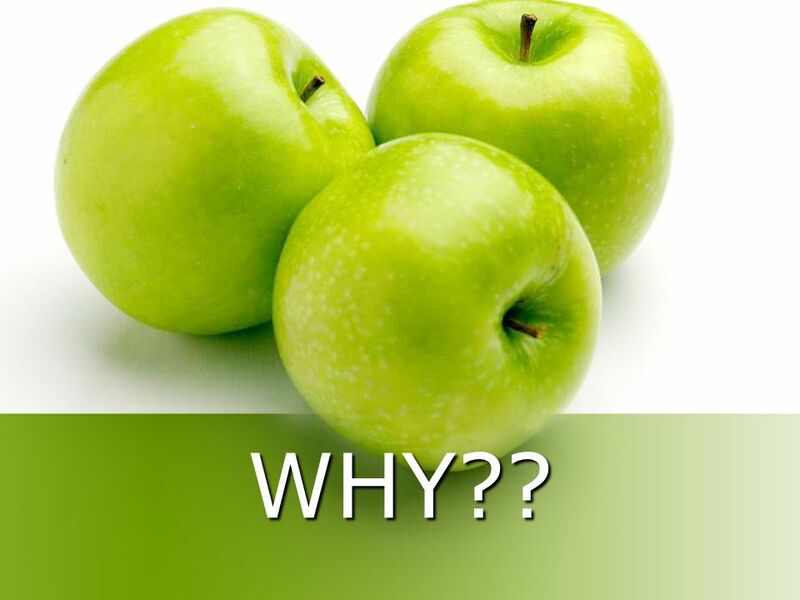 4 WHY? 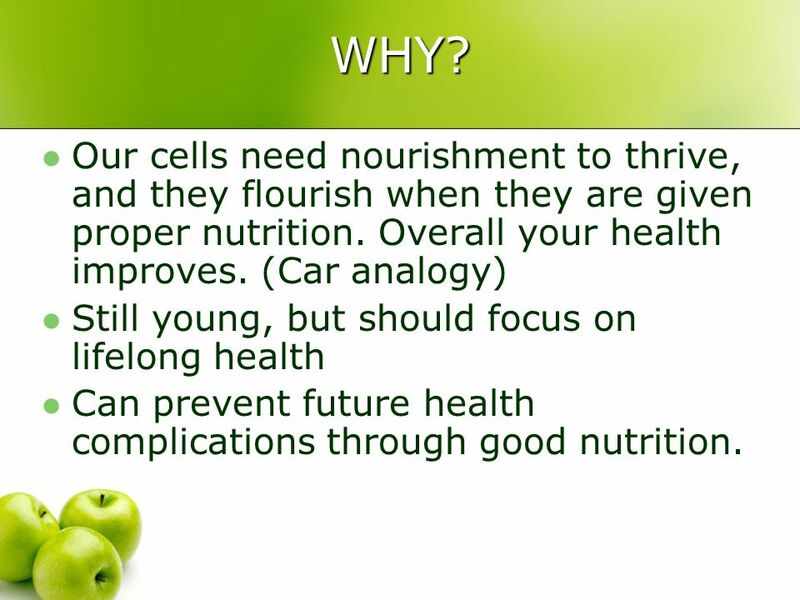 Our cells need nourishment to thrive, and they flourish when they are given proper nutrition. Overall your health improves. (Car analogy) Still young, but should focus on lifelong health Can prevent future health complications through good nutrition. 5 POP QUIZ!! What are the three main nutrients food provides us with? What is energy (used to fuel our bodies) usually measured in? Name one Vitamin. 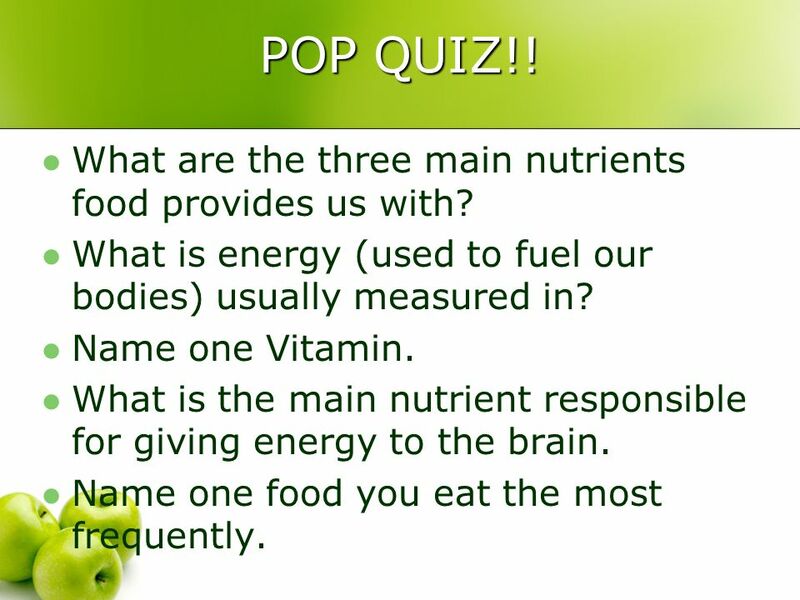 What is the main nutrient responsible for giving energy to the brain. Name one food you eat the most frequently. 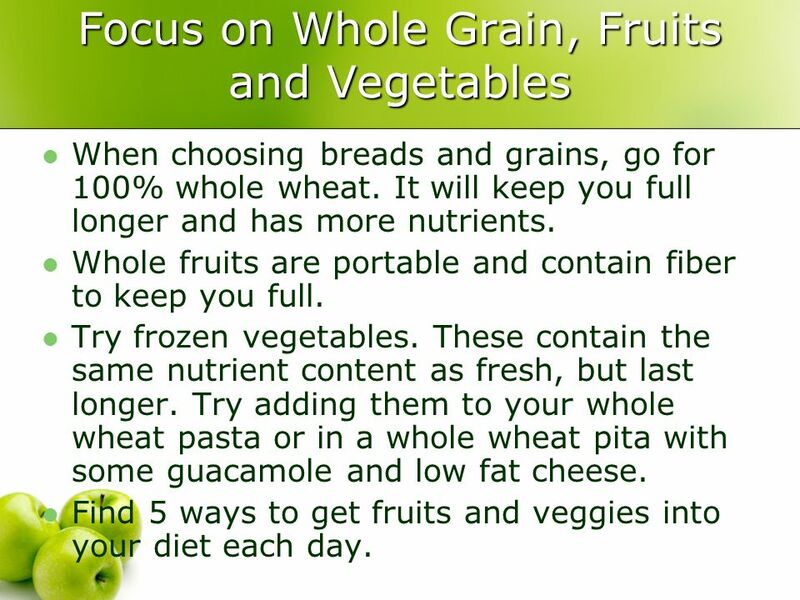 9 Focus on Whole Grain, Fruits and Vegetables When choosing breads and grains, go for 100% whole wheat. It will keep you full longer and has more nutrients. Whole fruits are portable and contain fiber to keep you full. Try frozen vegetables. These contain the same nutrient content as fresh, but last longer. Try adding them to your whole wheat pasta or in a whole wheat pita with some guacamole and low fat cheese. Find 5 ways to get fruits and veggies into your diet each day. 10 Not all fats are bad! Saturated-AVOID! Not heart healthy. Butter, heavy cream, lard, bacon, coconut and palm oils. Unsaturated-AIM FOR! 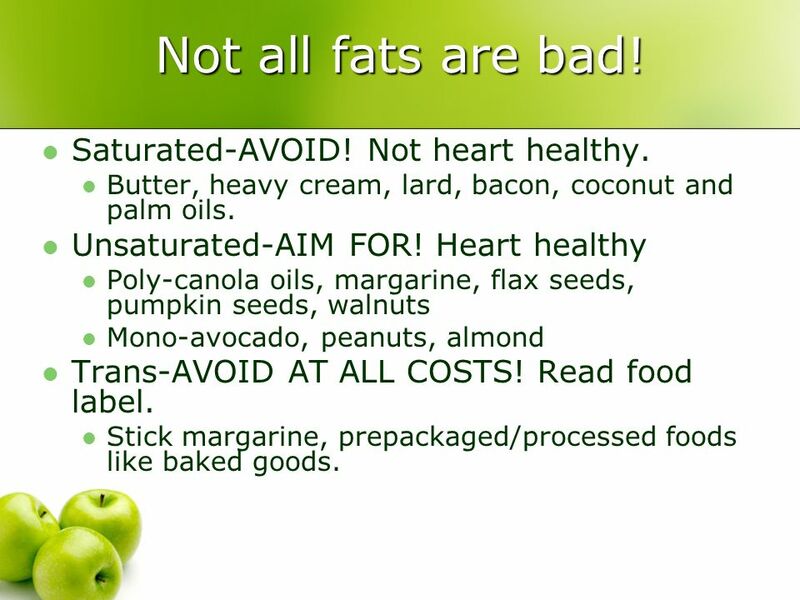 Heart healthy Poly-canola oils, margarine, flax seeds, pumpkin seeds, walnuts Mono-avocado, peanuts, almond Trans-AVOID AT ALL COSTS! Read food label. Stick margarine, prepackaged/processed foods like baked goods. 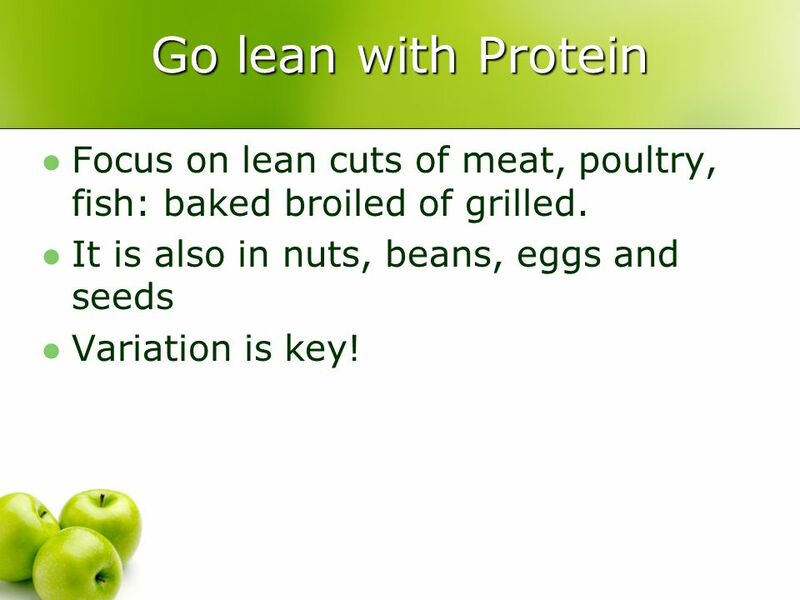 11 Go lean with Protein Focus on lean cuts of meat, poultry, fish: baked broiled of grilled. It is also in nuts, beans, eggs and seeds Variation is key! 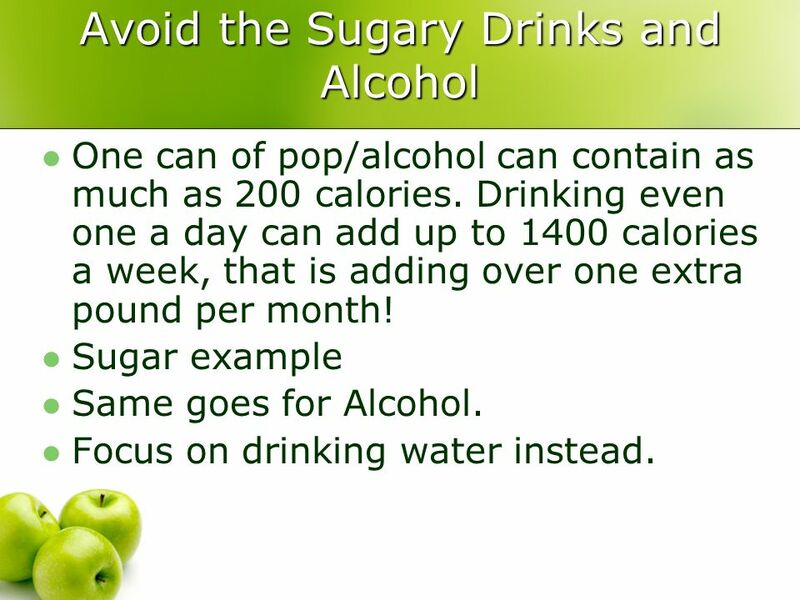 12 Avoid the Sugary Drinks and Alcohol One can of pop/alcohol can contain as much as 200 calories. Drinking even one a day can add up to 1400 calories a week, that is adding over one extra pound per month! Sugar example Same goes for Alcohol. Focus on drinking water instead. 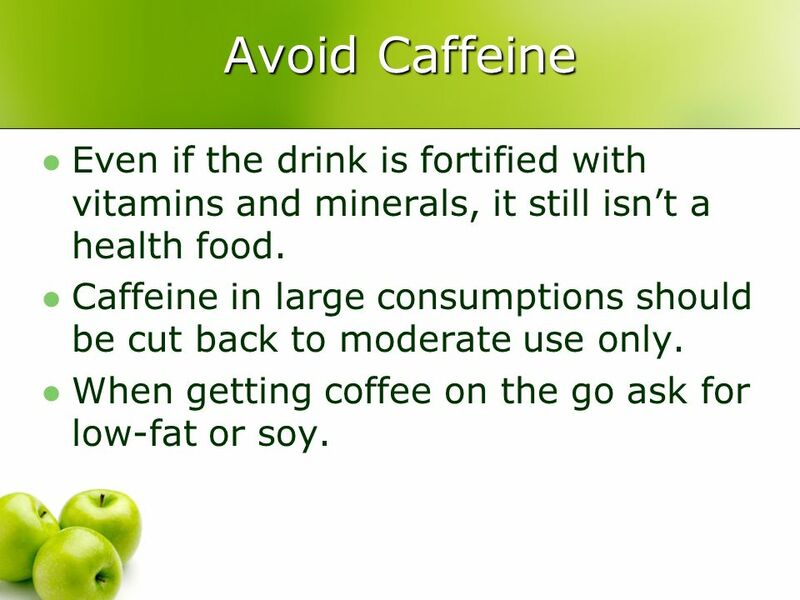 13 Avoid Caffeine Even if the drink is fortified with vitamins and minerals, it still isnt a health food. Caffeine in large consumptions should be cut back to moderate use only. When getting coffee on the go ask for low-fat or soy. 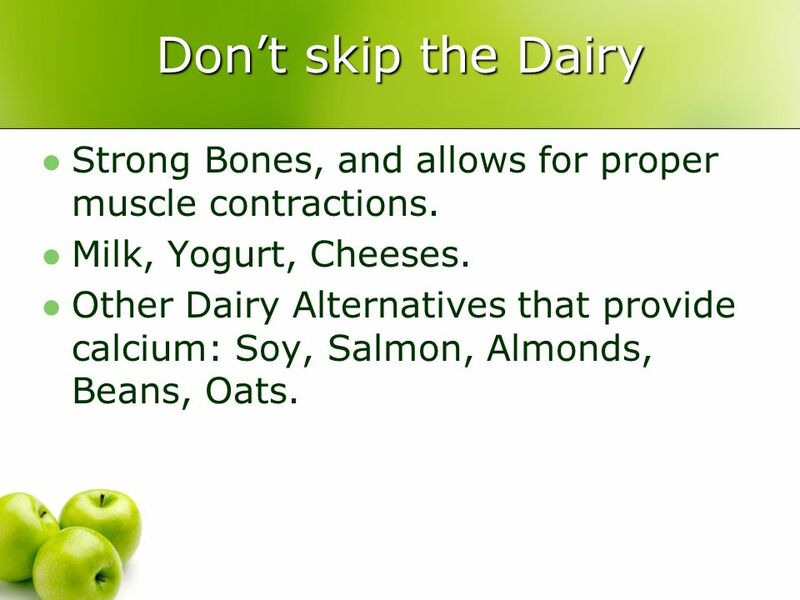 14 Dont skip the Dairy Strong Bones, and allows for proper muscle contractions. Milk, Yogurt, Cheeses. Other Dairy Alternatives that provide calcium: Soy, Salmon, Almonds, Beans, Oats. 15 Make time for Exercise Not only does it help to relieve the stress of deadlines, but it also helps to keep you strong. Make a routine, pick the days and times you can exercise and stick to it. 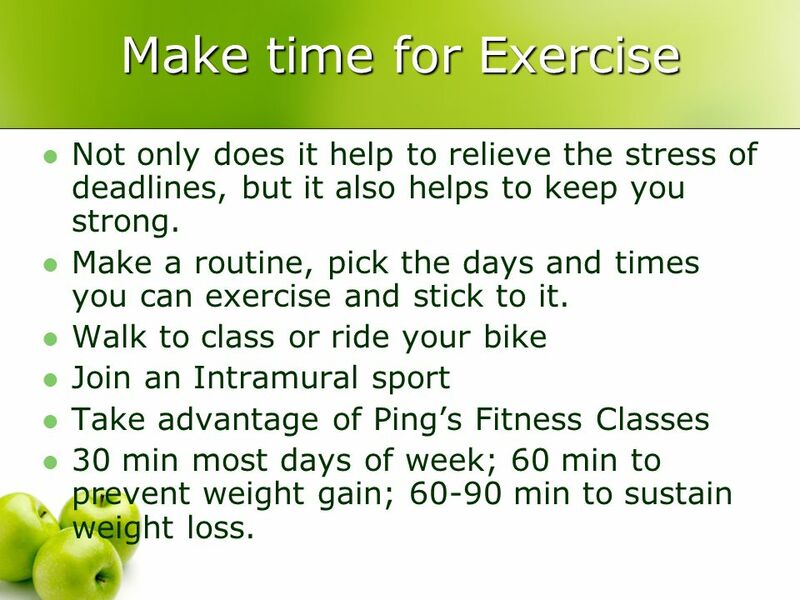 Walk to class or ride your bike Join an Intramural sport Take advantage of Pings Fitness Classes 30 min most days of week; 60 min to prevent weight gain; 60-90 min to sustain weight loss. 17 HOW? Get an idea about how much money you can spend each week on groceries. Think ahead. 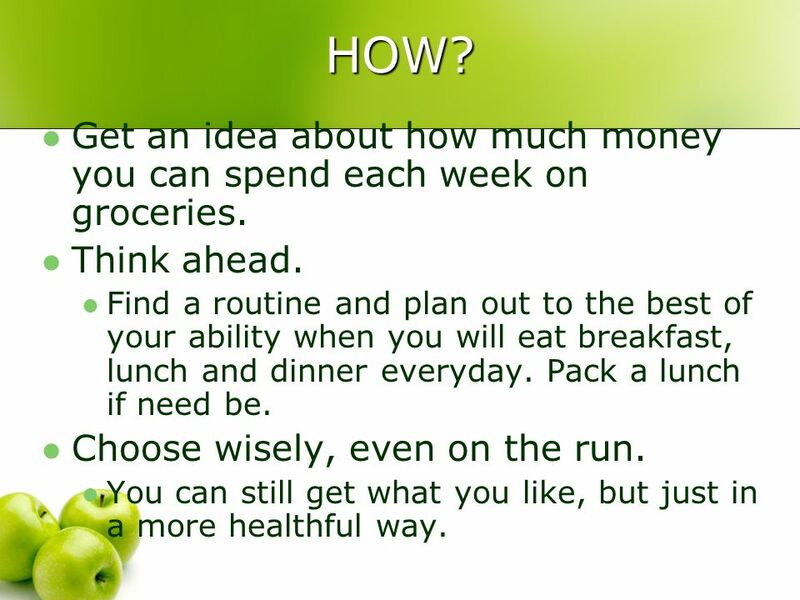 Find a routine and plan out to the best of your ability when you will eat breakfast, lunch and dinner everyday. Pack a lunch if need be. Choose wisely, even on the run. 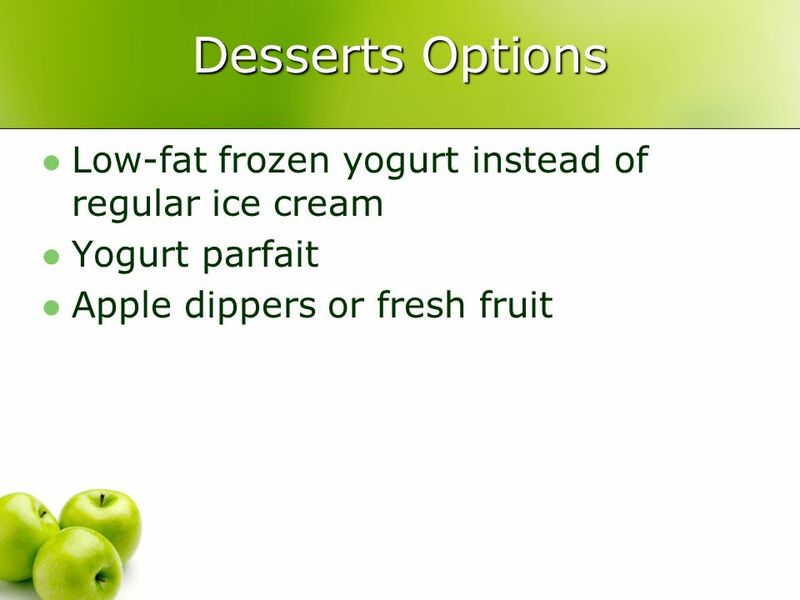 You can still get what you like, but just in a more healthful way. 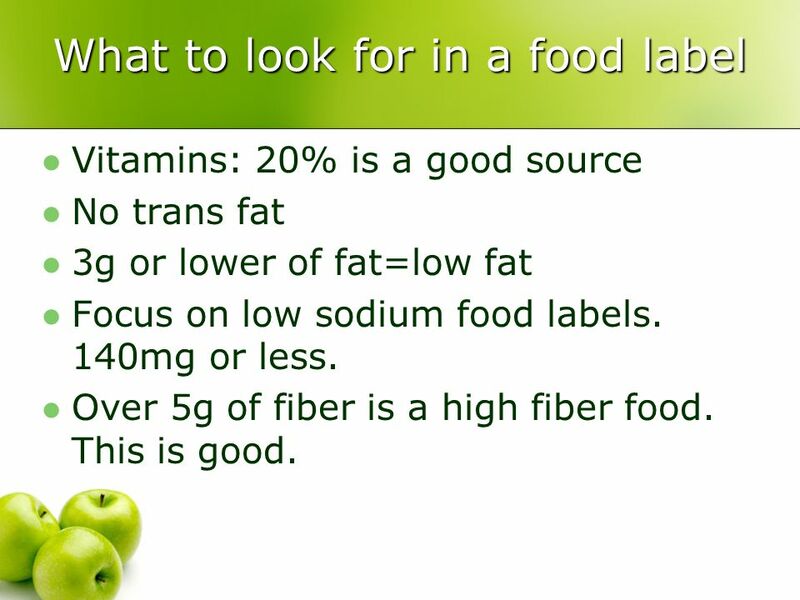 24 What to look for in a food label Vitamins: 20% is a good source No trans fat 3g or lower of fat=low fat Focus on low sodium food labels. 140mg or less. Over 5g of fiber is a high fiber food. This is good. 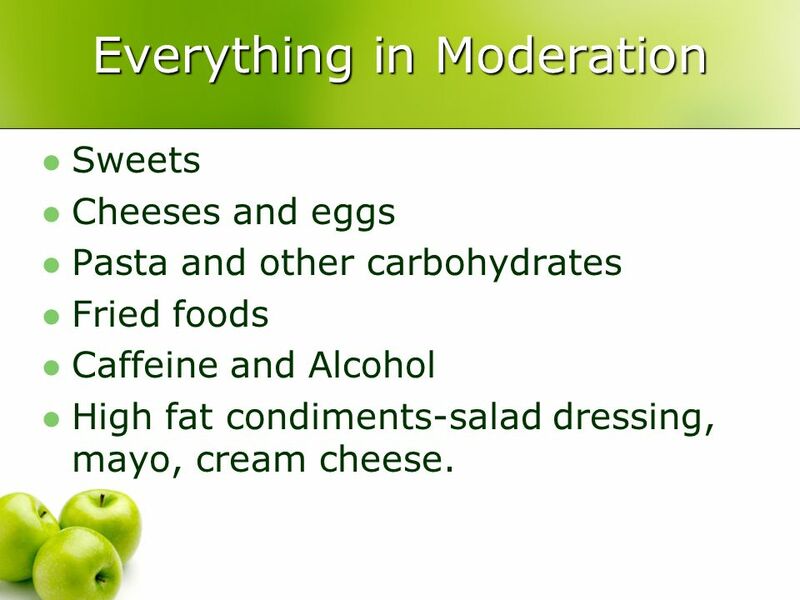 25 Everything in Moderation Sweets Cheeses and eggs Pasta and other carbohydrates Fried foods Caffeine and Alcohol High fat condiments-salad dressing, mayo, cream cheese. Download ppt "Eating Healthy in the College Years Colleen Poling, Erica Buchanan, and Nicole Sagaria." Common Sense guide to eating in the dining Centers. Eating Well with Canada’s Food Guide. 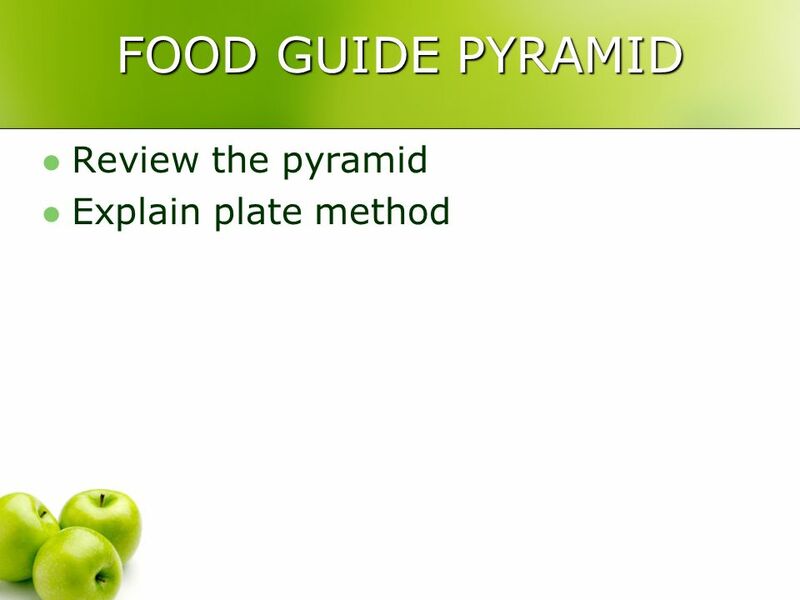 2 Canada’s Food Guide Defines and Promotes Healthy Eating for Canadians It translates the science of nutrition and. 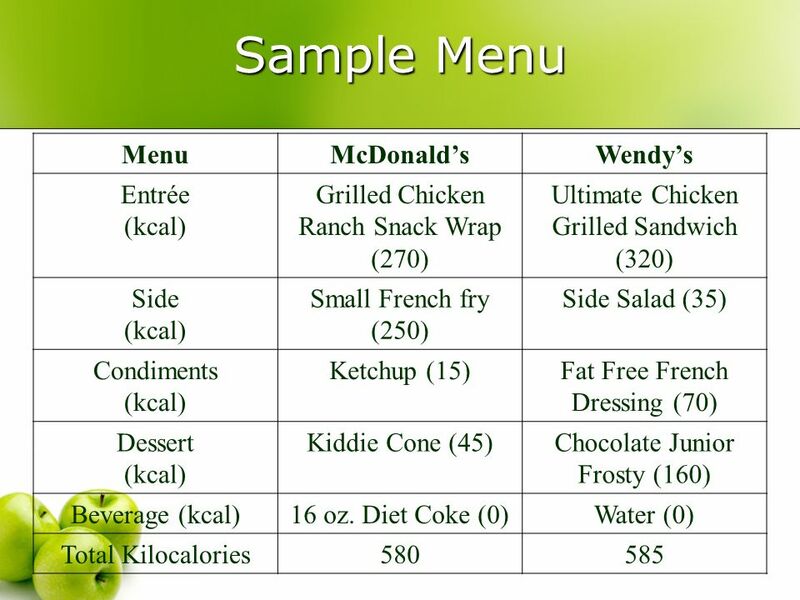 Illinois Wesleyan University How YOU can use nutrition to improve your performance. Presented by the IWU Athletic Training Staff. 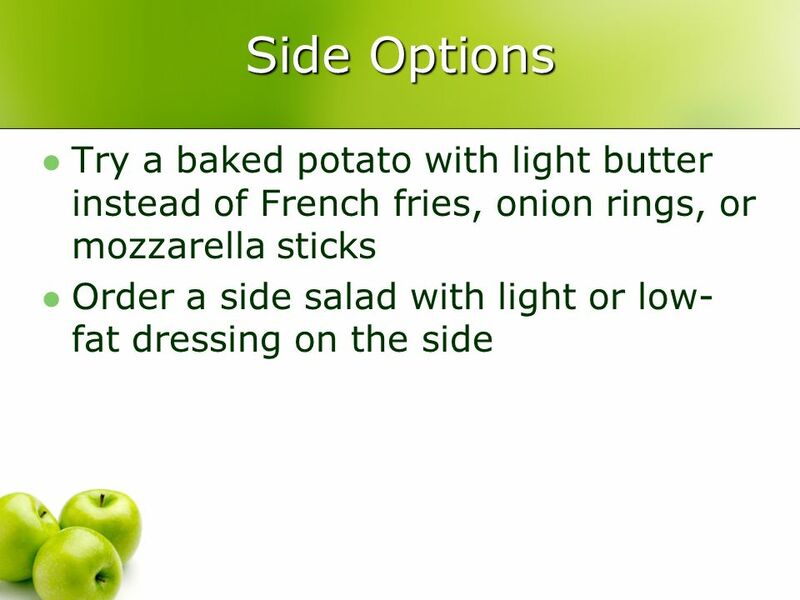 Nutrition Post-Stroke Common Dietary Restrictions After A stroke Diabetic Low calorie Low cholesterol Low salt You may also have restrictions on some. 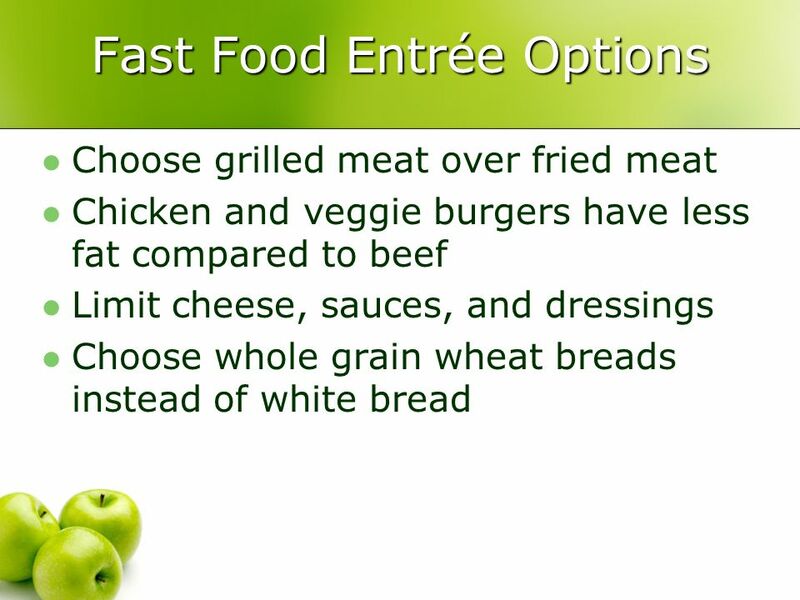 Eating healthy means eating a variety of foods from the basic food groups in reasonable amounts. 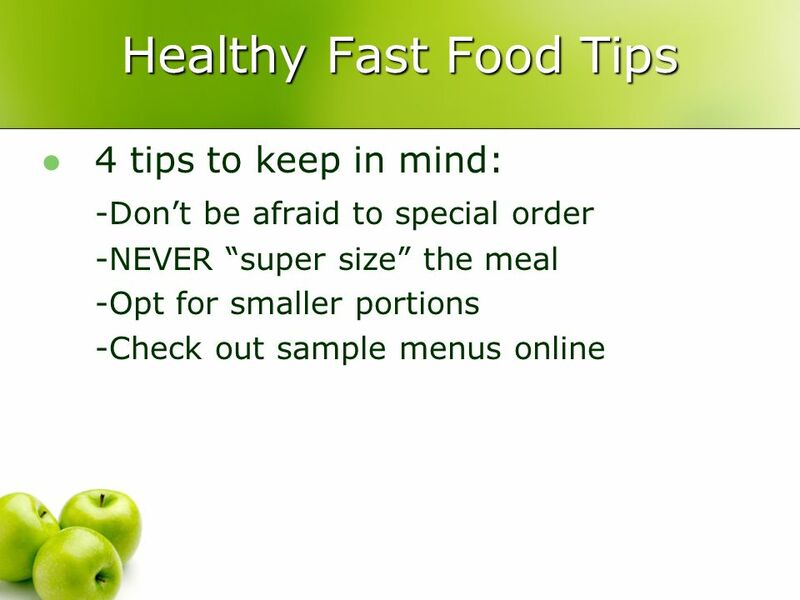 All foods can be part of a healthy eating plan when eaten. Preventing Diabetes Cutting Calories and Fat. Topics What can you do to reduce calories and fat? Which fats are healthiest? Teen Nutrition For all the right reasons! The University of Georgia Cooperative Extension Service. 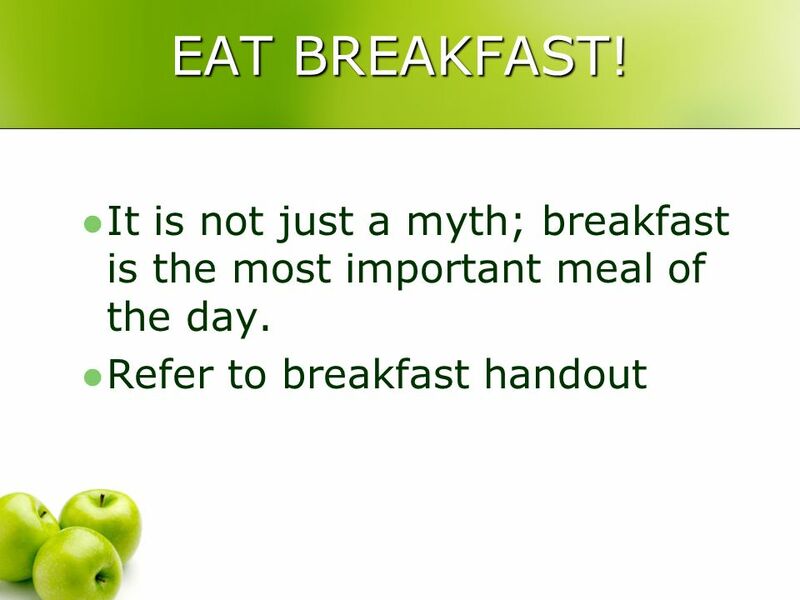  Many teens skip breakfast in the morning!  How does eating breakfast affect your ability to concentrate in class?  Most people that do not eat breakfast. NUTRITIONAL NEEDS By: Jenny Broschardt. NUTRITION Nutrition is the study of food and your body needs nutrients for sources of energy, materials for growth.